Here you will find a few notes on schooner rig with particular reference to the three masted gaff rig used on our own schooner Trinovante. 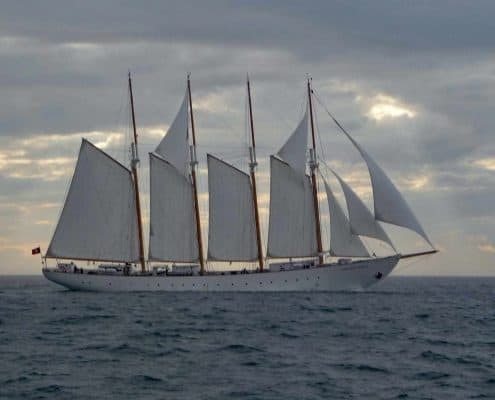 The schooner rig designed for Trinovante is very similar to that used by the American ‘Tern’ Schooners but Trinovante itself is most strongly inspired by the Portuguese fishing Schooners. You can view our Schooner’s Sail Plan here along with a few images showing how sail might be reduced as the wind increases. The Tern schooners were three masted schooners built from the early 1800’s on the East Coast of the United States. By the end of the century these merchant schooners were trading in large numbers in both Canada and the US. The three masters were more easily handled and economical to run than two masters of an equivalent size and it was soon found that they sailed very well too. The ‘Tern Schooner’ rig had three masts all the same height and didn’t carry square topsails. The Portuguese three and four masted fishing schooners were sailing commercially up until the 1970’s. Each year they made voyages across the Atlantic to the Grand Banks cod fishing grounds off Newfoundland. The fishermans staysail was a feature of these schooners and is a big powerful sail. It is set flying and does not require working aloft. Trinovante had a fisherman made for her in 2005. The basic shape was taken from photos of the Portuguese schooner Creoula and it has been a great success. In the right conditions it can add up to an extra knot on Trinovante’s speed. Here is a link to a 15 min film of the Portuguese schooner Santa Maria Manuela Fishing Off Newfoundland In The 1950’s. Made by the Canadian Film Board in the last few years these ships were still working, it is well worth watching. Smallest Three Masted Gaff Schooner? The smallest three masted gaff schooner we have come across is the North American Schooner ‘Souvenir’. Built in 1903 this schooner was only 61 feet long, Basil Greenhill mentions her in his book ‘Schooners’ and notes that she was ‘reported to have been a lovely vessel to handle’. If you fancy reading more about schooners check out our Schooner Books page. Finally you are more interested in ‘how to sail’ a schooner, below are links to the series of articles Trinovante’s skipper John has been writing for SchoonerSail’s newsletters about ‘Learning To Sail a Schooner‘. Sail off anchor, wind & tide together. Anchoring under sail on the run. Sailing off a quay, wind ahead. Sailing off a quay, wind aft. Tacking a 3 masted schooner.